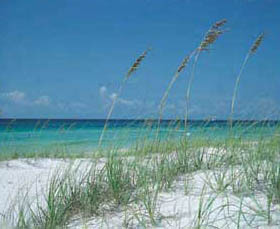 Whether by car, RV, train, bus, or plane, traveling time to Pensacola is never long. Pensacola is accessible from most major interstates and our regional airport has over 60 flights coming and going daily. Pensacola is not far from wherever you are: Atlanta (287 mi. ), Birmingham (260 mi. ), Chattanooga (424 mi. ), Chicago (922 mi. ), Cincinnati (716 mi. ), Dallas (751 mi. ), Detroit (975 mi. ), Houston (600 mi. ), Huntsville (346 mi. ), Jackson (347 mi. ), Kansas City (966 mi. ), Little Rock (603 mi. ), Louisville (644 mi. ), Memphis (475 mi. ), Milwaukee (1008 mi. ), Minneapolis (1286 mi. ), Montgomery (170 mi. ), Nashville (476 mi. ), New Orleans (225 mi. ), Oklahoma City (909 mi. ), Orlando (340 mi. ), Richmond (774 mi. ), St. Louis (745 mi. ), Toronto (1201 mi. ).